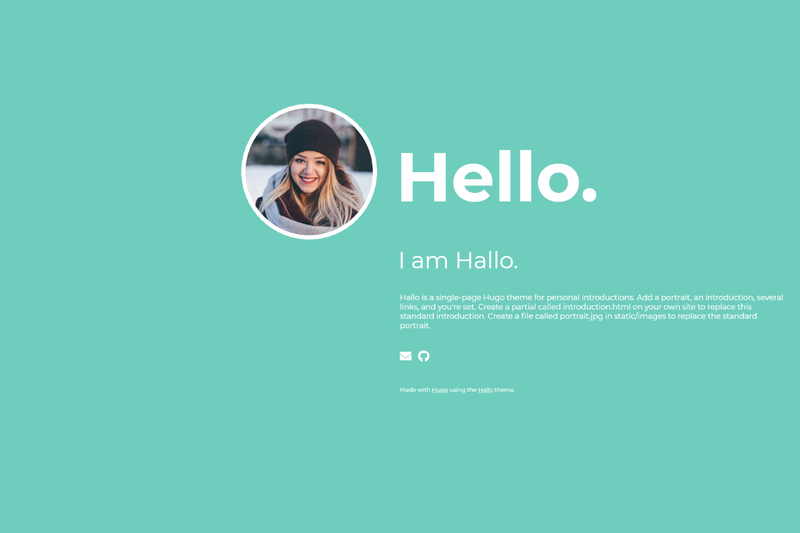 Hallo is a single-page Hugo theme for personal introductions. Hallo is a single-page Hugo theme for personal introductions. Add a portrait, an introduction, several links, and you’re set. If your site is also under version control using git, the easiest way to install this theme is to add it as a submodule. If you have not created a git repo for your project yet, you need to run git init beforehand. Inside the folder of your Hugo site, run the following command. Alternatively, you can clone the theme into your project. Add the following line to config.toml to tell Hugo to use the theme. Alternatively, you can tell Hugo to use the theme with the server command. If you have installed the theme as a git submodule, you can update the theme by issuing the following command inside your project folder. If you have cloned the theme, you can run git pull inside the theme folder. Put your own portrait in /static/images/portrait.jpg of your own site and Hugo wil automatically use that portraid instead of the standard one. It’s not necessary to alter the theme. Put your own introduction text in /layouts/partials/introduction.html of your own site and Hugo wil automatically use that introduction instead of the standard one. It’s not necessary to alter the theme. Hallo will use the name of the author that has been configured in the Author section of your site’s config.toml. Add the lines below to your config.toml to configure the name. Hallo by default allows you to choose an icon from the brands set. Put the name of the icon in the icon parameter. This set is the default set because these links will mostly be used for links to social media. To translate texts your site uses, add an i18n folder to your site. Feel free to submit pull requests for other translations of Hallo’s texts. background: Used as background colour of the site. foreground: Used for text and the border of the portrait. hover: Used for hover of links. Warning: When using Hugo Basic, you need to perform additional steps to make custom colors work. The SCSS needs to be transpiled for your custom colours, which is something Hugo Basic cannot do. For the standard colours, the transpiled SCSS comes with the theme. If you’re stuck with Hugo Basic, e.g. because your Hugo site is generated on a server that only has Hugo Basic installed, you can get custom colours to work by performing the following steps. Install Hugo Extended on your local machine. Generate your site locally by running hugo on your local machine. Commit the generated resources folder to the root folder of your site. This folder can be found inside the public folder after running hugo. Hugo Basic will then use this resources folder to find the transpiled SCSS. Stock portrait photo obtained here.